The Regenstrief Institute in Indianapolis, Ind., is an internationally-renowned healthcare research organization – itself a model for research, efficiency and innovation – that recently benefited from those same attributes, courtesy of numerous TEC® tile installation solutions. Altogether, a total of 7,100 sq. ft. of TEC® products were used throughout various spaces for this project. Known for developing better pathways to wellness, Regenstrief built a four-story, 80,000 sq. ft. building as the latest addition to its already impressive campus that serves as the institute’s headquarters. The new building is now home to the institute’s global research facility, with 165 staff members and a large number of allied scientists. TEC® products were used throughout hallways, bathrooms and stairwells of the new Regenstrief Institute headquarters. Regenstrief prides itself on improving the quality of care, increasing the efficiency of healthcare delivery, preventing medical errors, and enhancing patient safety. But those ideals could have been put at risk when serious issues arose with some of the new building’s floors during the early phase of construction. As work was just underway, the contractor, Indianapolis-based Certified Floorcovering Services, Inc. – a NTCA member – discovered that more than 3,000 sq. ft. of the concrete slab in the foyer and bathroom had a high relative humidity (RH) of 96. Moisture mitigation was the only way to solve the problem on the burnished, contaminated concrete, and TEC® moisture mitigation systems were the solution. Subsurface moisture has always been a potential Achilles’ heel of floor covering installations, but excessive moisture vapor emission rates (MVER) recently have become occasional problems with ceramic and natural stone tile installations. Today’s tiles – not as porous as they once were – are now often bonded directly to concrete, which has been covered with a waterproof and anti-fracture membrane, making installations more convenient and successful, but less breathable. On top of that, today’s fast-paced construction timelines mean installations may take place before concrete moisture levels are completely stabilized. TEC® LiquiDam EZ™ is the industry’s first single-component, liquid-based moisture vapor barrier. It dries in a quick four to five hours, allowing for same day flooring installation. “TEC LiquiDam EZ easily saves 30-40% on labor,” says Brian Estes of Certified Floorcovering Services, Inc.
Certified Floorcovering Services, Inc. decided to use TEC® LiquiDam EZ™ moisture vapor barrier to moisture mitigate 3,000 sq. ft. of the floors. Another 450 sq. ft. were mitigated with the original TEC® LiquiDam™. Both formulas, which can be directly applied onto green concrete up to 100% RH and may not require shotblasting on clean, sound surfaces, helped achieve a high level of moisture control and allowed the contractors to quickly move on with the installation. TEC LiquiDam EZ, which launched January 2016, is the industry’s first single-component, liquid-based moisture vapor barrier. It protects flooring and tile systems from damage caused by severe moisture and alkalinity, and can be hand-stirred and then directly applied. The single-component formula dries in a quick four to five hours, allowing for same-day flooring installation. LiquiDam EZ impressed the contractors with its resealable packaging – a bonus when reusing product for next-day jobs. LiquiDam EZ can be resealed and stored up to six months, and eliminates waste and special handling. After discovering that the concrete slab in the foyer and bathroom had a high relative humidity (RH) of 96, the contractor chose TEC moisture mitigation systems as the solution. Since the Regenstrief Institute is closely associated with the busy Indiana University School of Medicine and Health and the Hospital Corporation of Marion County, the job needed to be completed properly and in a timely fashion. When moisture problems are not addressed properly pre-installation, all sorts of potential issues may arise – particularly problematic for healthcare facilities that require sterile environments. Moisture control is one of the most crucial steps to carry out on the floor installation checklist. Yet this aspect of the process is all too often overlooked. Within the new Regenstrief building, TEC quality product solutions extended well beyond moisture mitigation. Four flights of steel stairs in the Regenstrief headquarters were covered in 12”x 24” large-format tiles – a challenge since steel is a difficult-to-bond-to substrate for tile installations. TEC Multipurpose Primer created a quick fix, directly bonding the tiles to 120 large steel stairs. TEC Ultimate Large Tile Mortar was used for its non-slump and non-slip formula for heavy tile and stone applications. Additional TEC products relied on during building construction include: TEC HydraFlex™ Waterproofing Crack Isolation Membrane, TEC PerfectFinish™ Skimcoat, and TEC Power Grout in DeLorean Gray. TEC products were used throughout the headquarters in the hallways, bathrooms, and stairwells. Distributor Louisville Tile provided the 12” x 24” large-format tiles from Crossville, which were a sleek gray with subtle accents. Designed by Schmidt Associates of Indianapolis, construction started in October 2014 and was completed in November 2015. The nonprofit medical research organization is dedicated to improving the quality, cost, and outcome of healthcare around the world. Regenstrief investigators work closely with nearby schools and hospitals – Indiana University’s School of Medicine, Sidney and Lois Eskenazi Hospital, the Roudebush VA Medical Center, Riley Hospital for Children at IU Health and IU Health University Hospital. For more information about TEC, visit www.tecspecialty.com. The TEC® brand is offered by H.B. Fuller Construction Products Inc., a leading provider of technologically advanced construction materials and solutions to the commercial, industrial and residential construction industry. Named “one of the world’s most ethical companies” by Ethisphere in 2013, and headquartered in Aurora, IL, the company’s recognized and trusted brands – TEC®, CHAPCO®, Grout Boost®, ProSpec®, Foster®, and others – are available through an extensive network of distributors and dealers, as well as home improvement retailers. For more information, visit www.hbfuller-cp.com. It began approximately 15 years ago when an Italian equipment manufacturer by the name of System Group came up with a new way to press tile with a process they called Lamina. It worked to gain traction for the product manufactured by this process by building a factory and showing people that a new way was viable and the product it made – hopefully – could change the face of tile making forever. A little bit of this product trickled into the U.S. market, but it was not until approximately five years ago that this tile entered the domestic market in a meaningful way. Along with the product, came the hopes of revolutionizing how people think about a material that has been around for a few thousand years. The market was already moving in the direction of larger sizes: 12”x 24” was starting to replace 12”x 12” as king of the hill; 18”x 36” was starting to pick up steam; and 24”x 48” was being dabbled with here and there. This new thing was a tile over 3’ wide and approximately 10’ long – and to make it more complicated – with a thickness of only 1/8” to 1/4”. It was for sure sort of an anomaly that no one really thought could go anywhere. For the first 18 months or so most thought it was a fad that would go away, then designers and architects started to get excited and we started to see specifications for it. This presented a new challenge; no one knew how to install it or what the rules were. So, a few tile and thinset manufacturers started to look at traditional setting methods as a basis for developing new techniques that would be necessary to comply with existing standards of coverage, lippage, etc. In an ANSI meeting about three years ago there was enough awareness that while maybe a standard was not in the immediate future, it was clear something had to be said about it. Chris Walker of NTCA Five Star Contractor David Allen Company was designated as the leader of an ad-hoc group mandated to draft a statement for inclusion into the TCNA Handbook for Ceramic, Glass and Stone Tile. Walker and company wrote some language for what they called “reduced thickness tile” and our industry documents started for the first time to recognize these new materials. By this time we were seeing even larger tiles, up to 5’ wide, and in some cases more than 10’ long. By now a second technology from SACMI was emerging called Continua Plus, compacting porcelain powder between two large steel rollers. System Lamina technology was continuing to innovate as well, with even larger sizes and textures pressed between its new equipment that was more than 17’ long with plates more than 5’ wide with 50,000 tons of pressure. Both technologies advanced in thickness capability as well, able to press up to 30mm. From here momentum was starting to grow; a few manufacturers started talking about drafting a product standard to protect this new market from lesser-quality materials. With the advancements in technology and the growth of the market, it was becoming evident that standards would soon be necessary. So a couple of companies that believed in the future of the category decided to start some testing, and sure enough we started to see data that would serve as the outline for a product standard. At the April 2015 ANSI A108 meeting it was formally decided to move forward with the product standard, as well as form an ad-hoc group to begin work on an installation standard to be called A108.19. To drive the product standard quickly, tile manufacturers started to formalize the criteria around the terminology, thicknesses, breaking strengths, and other physical properties required to accurately describe the characteristics and quality of this category. As of the last meeting of the TCNA Tile Technical Committee in mid-July 2016, tile manufacturers had reached a general consensus that the majority of the content in the draft of the product standard was nearing completion for submission and subsequent ballot to the full ANSI A108 committee convening in October of this year. Part of the evolution of the standard includes a name change from “large thin porcelain tile” to “gauged porcelain tile panels/slabs. The name change to “gauged” is based on two main things: the technology now being able to produce thicker materials that one day may be encompassed by the standard (so thin no longer made sense); and second the need to use a replacement term that describes materials produced to a precise thickness that determines their physical properties and areas of use. So we picked a term used to describe exactly that, similar to how “gauged” is used to describe wire or sheet metal. For panel/slab, we just recognized that both terms were being used in the industry/market so to recognize that fact and not hinder anyone’s way to market, we decided to propose the use of the dual term. In the meantime, the ad-hoc committee for the installation standard has also been hard at work. The first step was to get together as a group and look at all of the existing information from around the industry pertaining to these materials. Once the data was analyzed, an outline was created to address all of the different concerns brought by the members of the committee. The next step was to look at the variables of piece size, embedding technique, coverage rates, lippage tolerances, qualified labor language, and other required criteria needed to complete a comprehensive standard. 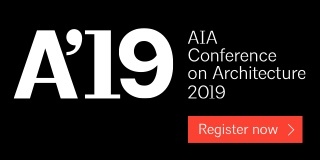 Drawing on the information and data supplied by different members of the committee we have been able to complete a draft that was distributed at the A108 meeting at Coverings 2016. While there is still some work to be done, the majority of it has been completed, and all signs point to a viable draft being distributed at the same A108 meeting in October of this year, and taken to ballot soon thereafter. As the leader of this group I can say the dedication to the effort has been second to none, and I would personally like to thank all involved for participating diligently and unselfishly to better the industry in which we work. Because of this collaborative effort we are well on our way. The NTCA Methods and Standards Committee’s work over the last two years reaped great success at the TCNA Handbook meeting in Atlanta, Ga., recently. There were six proposals submitted, and with great help and guidance from the TCNA staff, all were approved. Following is a brief summary on each of them. Under the section GROUT JOINT SIZE AND PATTERN CONSIDERATIONS, you will find two new sub-sections, “System Modularity” which clears up confusion on modular tile sizes, gives design professionals guidance on using different sizes together, and points to the simple truth that when the tile modularity is not understood, design compromises are inevitable. The second new sub-section is “Tile Layout” which gives general tile layout provisions addressing reasonable expectations and limitations that challenge most projects. Under the section USING THE TCNA HANDBOOK FOR SPECIFICATION WRITING, a new sub-section called “Design Considerations When Specifying Tile,” references the Handbook’s many sections that design professionals must familiarize themselves with that impact the selected tiles and designs. It gives a very important reference that strongly recommends industry standards, guidelines, and best practices to be followed and strongly discourages variances from them. It also recommends in-situ mock-ups to be used under the given job site conditions. Under the section FINISHED TILEWORK, is a new sub-section called “Visual Inspection of Tilework.” This will be extremely helpful for the industry. It recognizes the hand-build aspect of tile installations, references substrate requirements, lippage, allowable warpage, effects of lighting and many more factors that affect the installation visual and aesthetic appearance of the finished tilework. It also gives guidance on viewing distance and lighting when finish tilework is being inspected. Another accomplishment, with substantial consultation from Crossville’s technical staff Noah Chitty and Tim Bolby, was major additions to EJ171 MOVEMENT JOINT GUIDELINES. Most notable changes are recommendations in movement joint width and depth. The additions give a chart for minimum movement joint widths (for dry interior, not exposed to sun) in relation to joint frequency and tile thermal expansion properties, along with reference to the proper ASTM guides for calculating the joint. Another addition to this section is a new sub-section called “Wall Tile Movement Joints in Framed Wall Assemblies” (with substantial consultation with Tony Fuller of National Gypsum) which gives the design professional awareness that wall movement joints are unique and require consideration of other wall components such as sheathing, framing and backer board before the wall is constructed – and that such considerations many times cannot be retroactively added. Members of the NTCA Methods and Standards committee, representatives from Crossville, National Gypsum MAPEI, TEC and Bostik, and the TCNA staff all assisted with the states submissions described in the article. Many of us are familiar with the effects lighting has on an installation. A substantial new Lighting and Tile Installations section has been added to give importance to this issue which can lead to much heartache for all involved. The majority of the added language was taken from the NTCA Reference Manual, so for many of you this will look familiar. There was also language added to the MORTAR AND MORTAR COVERAGE section noting 100% mortar coverage is not practical. Many specifications call for 100% mortar coverage but this cannot be consistently attained and therefore it should not be specified. It has been well-established that mortar cure times are extended when impervious tile is installed over waterproof or crack-isolation membrane. To alert design professionals of this situation, language has been added to the SETTING MATERIAL SELECTION GUIDE. Other conditions that will also delay cure times are narrow grout joints and using high-performance grouts. Recommendations of extending turnover of the floor to traffic are given. Other language added pertaining to membranes is in the MEMBRANE SELECTION GUIDE. A new sub-subsection called “Considerations When Using Membranes” that not only references the above-noted extended cure times for mortars, but also the fact that the hollow sound of tile installed over membranes is normal and not indicative of loss of bond (without concomitant installation issues). The last submission involved the continued discussion of the disparity between division 3 and division 9 floor flatness. The section on SUBSTRATE REQUIREMENTS gives many references to this. The language we submitted further clarifies this difference. One of the key points to note is when division 3 floor flatness (FF) levels are specified, the floor must be verified to assure the specified levels are attained. This may seem implied, but many times this test is not performed. Therefore it quickly becomes a source of tension for projects when it’s required to correct the floor to division 9 specifications, and the tile contractor requests to be compensated for the work. This also leads to another important addition to this section: recommendations for the design professional to incorporate a separate allowance to correct the floor flatness from division 3 to division 9 specifications. As chairman of the Methods and Standards Committee, I want to thank its members, the gentlemen from Crossville and National Gypsum mentioned above, representatives from MAPEI, TEC and Bostik, and the TCNA staff for helping us with these submissions. Our next meeting with be October 22 at the Hyatt Regency Indian Wells Resort & Spa in Indian Wells, Calif., during Total Solutions Plus, October 22-25. If you have topics you feel would be appropriate for this committee to consider, you are welcome to contact me at [email protected]. As many of you know, I wear two hats for the NTCA: President, and Chairman of the NTCA Technical Committee. As a tile contractor it is the technical aspect of our business that will determine the success or failure of that installation. These hard-working tile contractors have gone above and beyond when it comes to fighting for both union and non-union tile contractors, both NTCA members and non-members. I want to commend all of these people for volunteering their valuable time and energy to make our industry better. We at NTCA have committed to our members that their thoughts and concerns are heard and disseminated in front of national industry installation standards committees. Please know that there are a lot of NTCA tile contractors that I failed to mention who work very hard and volunteer their time as well, and I want to say thank you to all of them too. As you can see, there are a lot of NTCA members who give their time and effort to make sure the entire tile installation community can be more successful. If you have a chance at the next meeting, go ahead and tell them great job or nice work – it will mean a lot. In early August, the National Tile Contractors Association participated in an invitation-only Installation Summit, promoted by leaders of the Floorcovering Leadership Council and managed by Informa Exhibitions. The event took place at the Omni Dallas Hotel. Over 70 industry professionals, including 25 from the tile and stone industry, came together to address what many people are now referring to as an installation crisis, especially as it relates to overall quality and availability of a trained workforce. This was an important first step in addressing a serious issue. For many years, the lack of qualified installers has plagued our industry. With the economic recession now past, and a steady increase in growth in all flooring segments, we find ourselves faced once again with this shortage. What makes this even more challenging is that a new generation of workers does not appear to be on the horizon. Discussion at the Summit centered around all the great jobs available in the flooring industry, and the realization that there is very little awareness of these opportunities – not just in installation, but in sales, design, management, etc. By holding an Installation Summit, we’ve brought all the groups together to identify common challenges, with the hope of a collective approach to address a potential crisis in all segments. Training and apprenticeship programs, certification, on-line education, and recruitment of new people into the trades were all listed as critical items to work on collectively. Following this town-hall group approach, tile and stone leaders met in intensive breakout sessions, seeking feedback to association direction in our industry. Representatives of the NTCA, MIA and BSI, and the CTEF were able to engage with our members for a focused discussion of how to work with other flooring industry segments. On the second day of the Summit, all the attendees got back together to discuss next steps. The leaders of the Summit came out of the meeting with some clear direction. The group agreed an awareness campaign needs to be developed to inform people of job opportunities in the industry, with a special emphasis on installation as a trade. In order to accomplish this, Summit leaders agreed that a small group representing a cross-section of the industry will need to be created to brainstorm how to achieve these steps. This group will be appointed by Summit leaders, and will work closely with the Floorcovering Leadership Council for support and direction. The NTCA would like to thank its staff, contractor and associate members who attended the event and provided valuable feedback. We are committed to participating in the committee, and will give a full report to our board of directors at our annual meeting, held in conjunction with Total Solutions Plus October 22nd-25th in Indian Wells (Palm Springs), Calif.
As science fiction writer Arthur C. Clarke aptly stated, advanced technology is a bit of magic. We see the stuff of this today – surface treatments, glazes and inkjet printing processes for tiles that replicate anything from lace to wood with perfect authenticity or quirky artistry; tiles that are thinner than the diameter of a pencil; mortar that can bend and flex…the list is endless. Our industry truly is a marvel of advanced engineering that provides a spectrum of amazing surfacing materials, setting materials, tools, and accessories with which to make projects more enduring and better performing, while streamlining the process for the installer. The magazine you hold in your hands pays homage to this. Welcome to the 2016 repeat performance of our TECH issue of TileLetter. NTCA debuted this publication in 2015, and it’s back this year by popular demand. 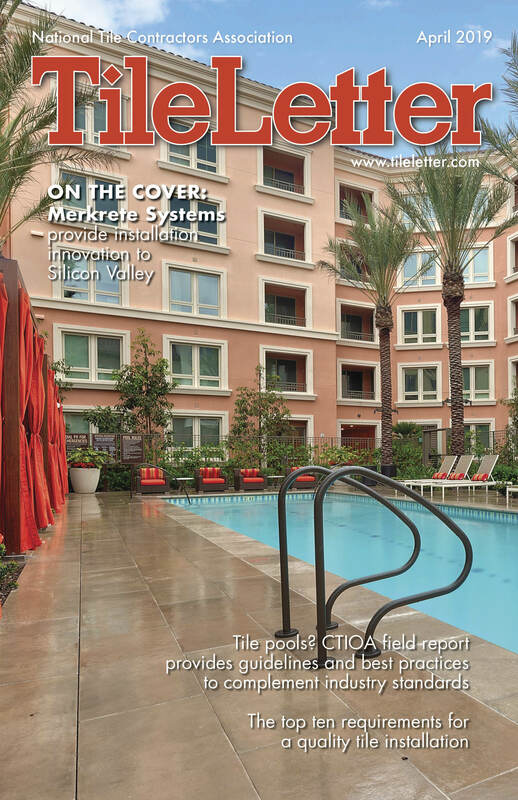 Overall, this issue takes an in-depth look at new technologies and advances of a range of product categories: substrate preparation; electric floor warming; shower systems; mortars; grout; tools, accessories, and apps; and this year we added a sustainability category. Within each category, you’ll find manufacturer comments about the direction the category is taking and what advances we can expect to see emerging over the next year. As an adjunct to each category, we present a range of new products that demonstrate these cutting-edge advances. And in many categories we include comments from contractors and installers working in the field. These give a view on what REALLY works and what doesn’t by those putting them to the test on the job – and occasionally ideas for improvement. 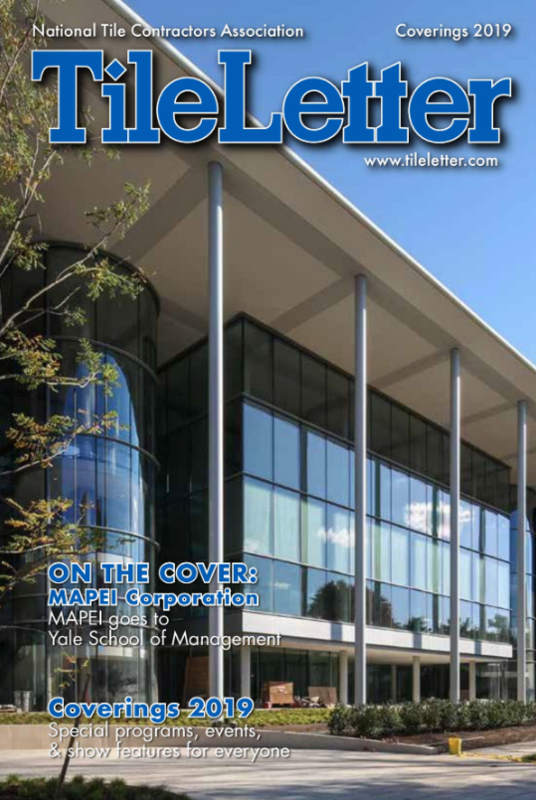 In addition to our category content, we have a cover feature by TEC about the expansion of The Regenstrief Institute in Indianapolis, Ind., and a collection of stories that support the advance of technology and standards in our industry. Kevin Fox, Methods and Standards Committee chairman discusses the development of some new submissions and additions to the 2017 TCNA Handbook for Ceramic, Glass and Stone Tile Installation. Crossville’s Noah Chitty updates us on the latest in the quest for product and installation standards for gauged porcelain tile, the tile formerly known as large thin porcelain tile. NTCA president Bart Bettiga uses his Publisher Letter to report on the first-ever Installation Summit, held in Dallas at the beginning of August, which brought together 70 representatives from all flooring installation sectors (25 from tile and stone alone!) to put their heads together about what is being called an “installation crisis” – particularly quality work and lack of experienced installers. 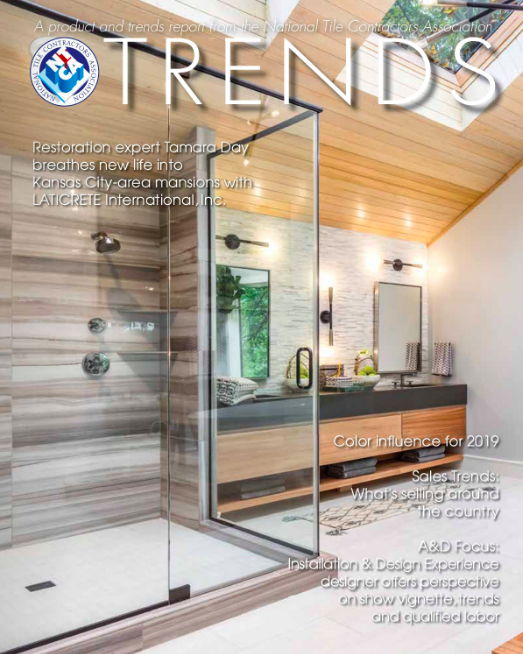 Something that’s new for this year is the Regional Sales Snapshot, where several major suppliers share information about what is selling in their region, in terms of setting materials, tools and tile and stone products.